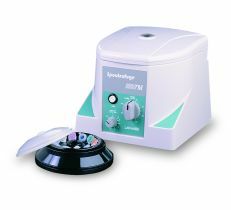 The compact Spectrafuge 7M is ideal for quick spins, microfiltration, separation of small blood or cell samples and other applications requiring lower speeds. Complete with a 12 x 1.5/2.0 ml rotor, the Spectrafuge 7M will also accept 0.5 ml tubes with the supplied adapters. Adapters for 0.4/0.25 ml tubes and 0.2 ml thermal cycling tubes are sold separately. The translucent rotor cover snaps on and off with one hand. The rotor can be removed from the centrifuge for cleaning. All operating parameters are set with easy turn knobs on the front panel of the unit. While running, the Spectrafuge 7M is exceptionally quiet. The housing has been specially designed to allow ambient air to circulate throughout the rotor and motor chambers, keeping sample temperature rise to a minimum. For samples requiring subambient temperatures, the unit may be used in a cold room.